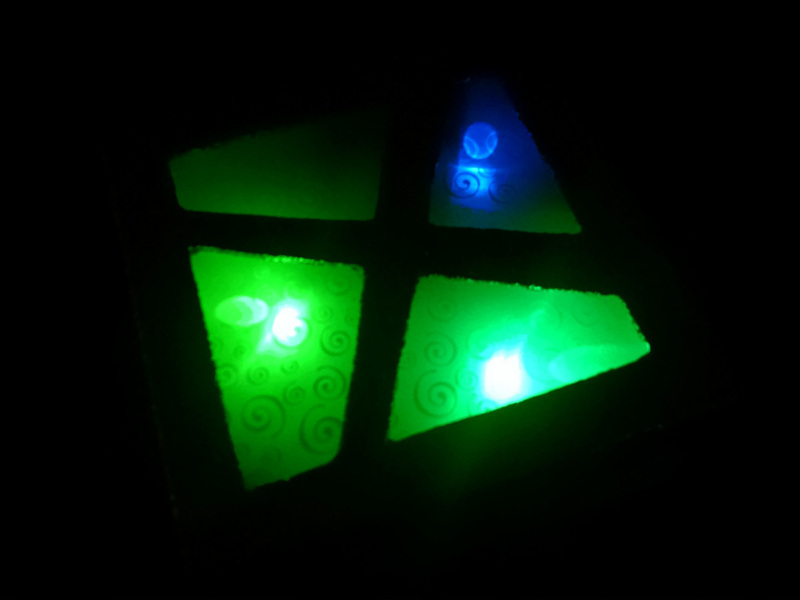 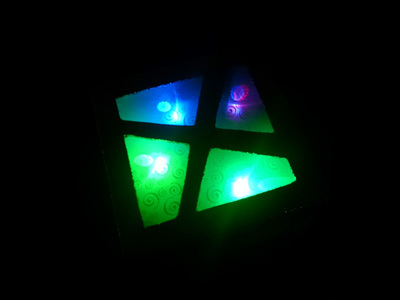 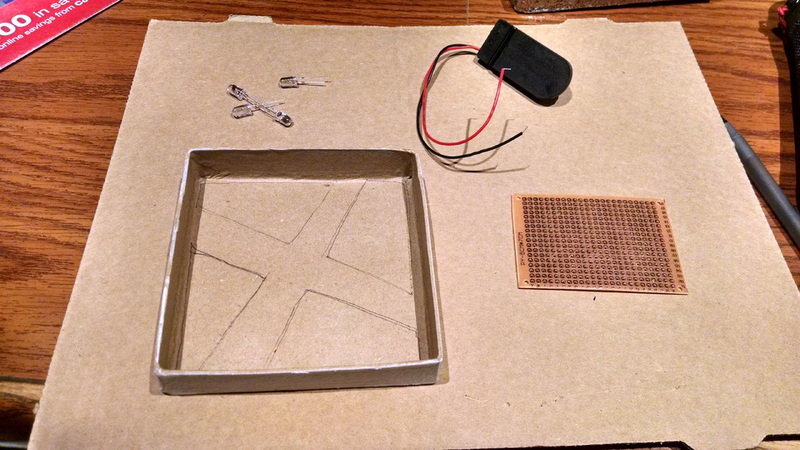 The box is going to be pretty simple with multicolor LEDs which would run from a couple CR3032 cells. 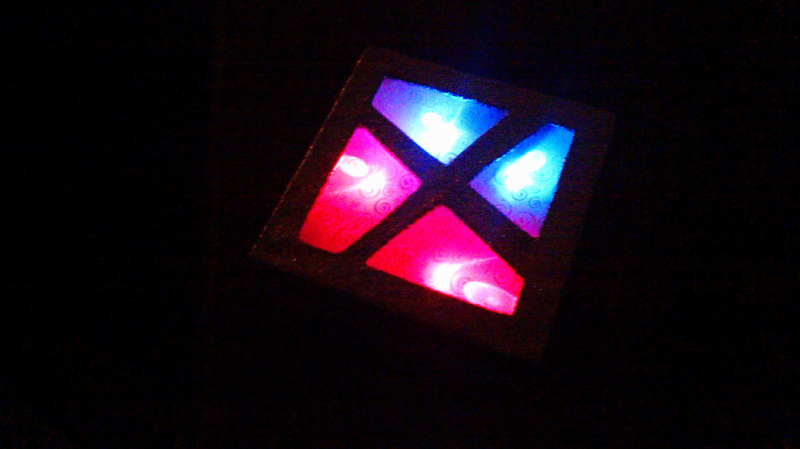 There is really nothing special here, just some color changing flashing LED's, resistors, a breadboard and battery holder. 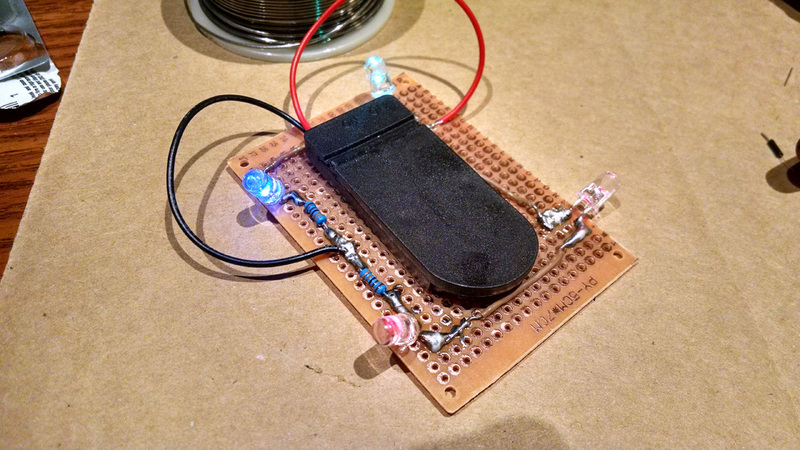 I did have a moment where I had to stop myself from going overboard by adding an AT-Tiny or a PIC with a motion activated switch or even some Bluetooth module. 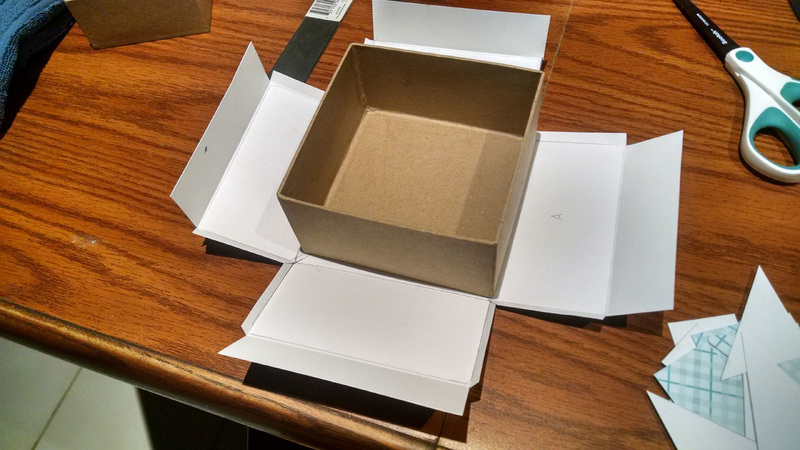 This really needs to be simple and cheap since it is just a box. 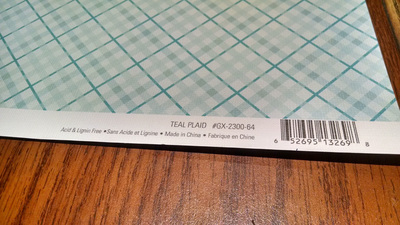 One sheet of Decorative Paper large enough to cover the bottom of the box, and another piece that is translucent (to allow the LED's to shine through (I found these at a craft store). 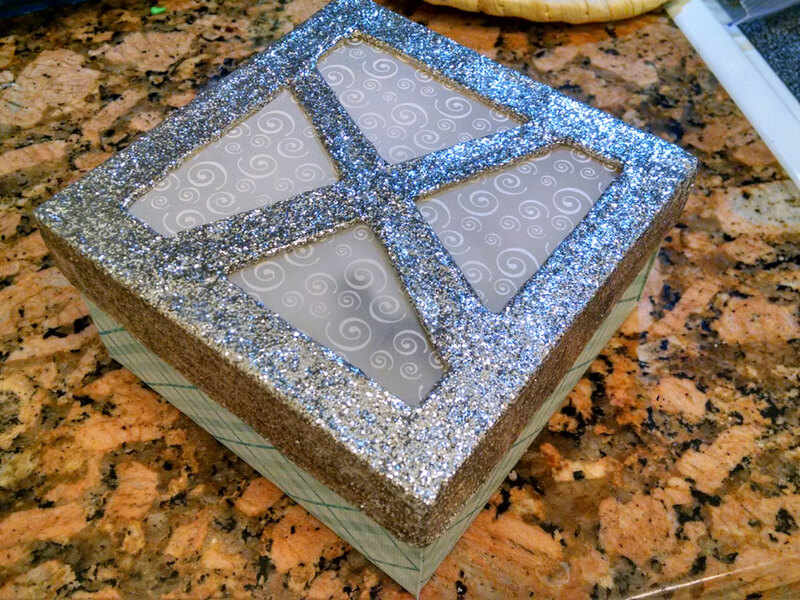 Paint for the top, I used some glitter paint that took 6 coats to get decent coverage. Would not use that stuff again, but it did turn out nice. 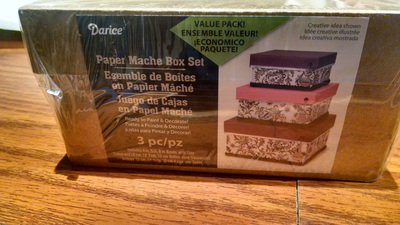 I wrapped the bottom of the box with the decorative paper. 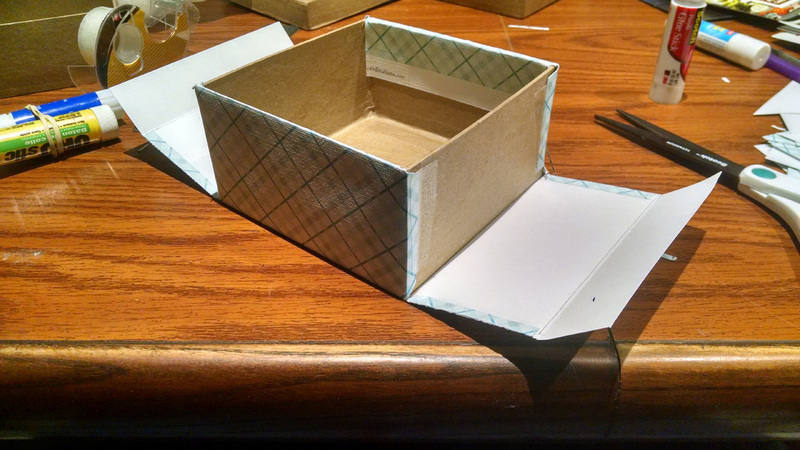 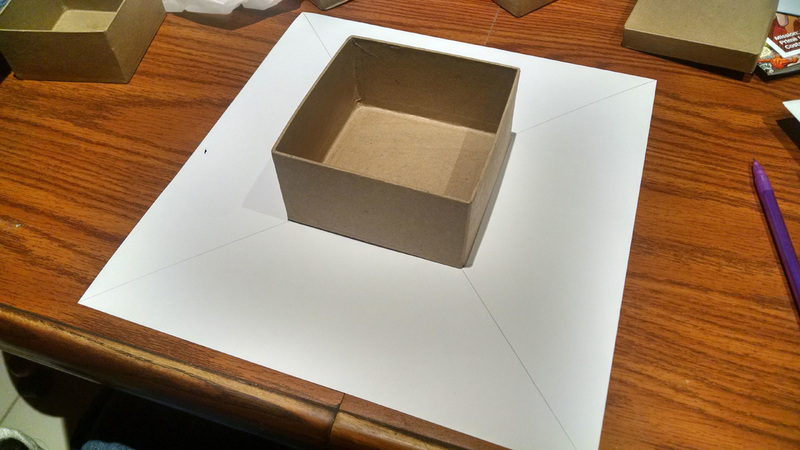 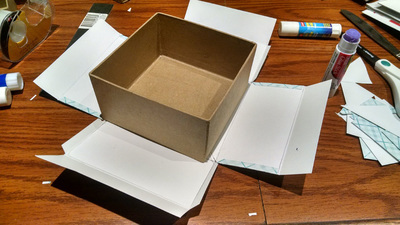 I used a butter knife to score the fold lines and used tape and glue to paper the box. A metal ruler, scissors, some tape and glue sticks were also used. 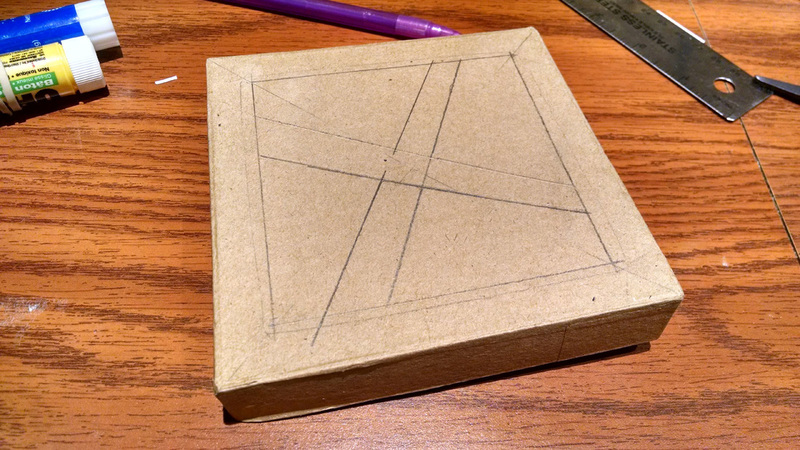 I first put an X on the back of the paper to help me center the box and aligned the corners of the box as best I could (the paper mache boxes are not perfect so will be a bit less than square). One side of the box was also marked along with a corresponding mark on the paper so the orientation would be preserved. 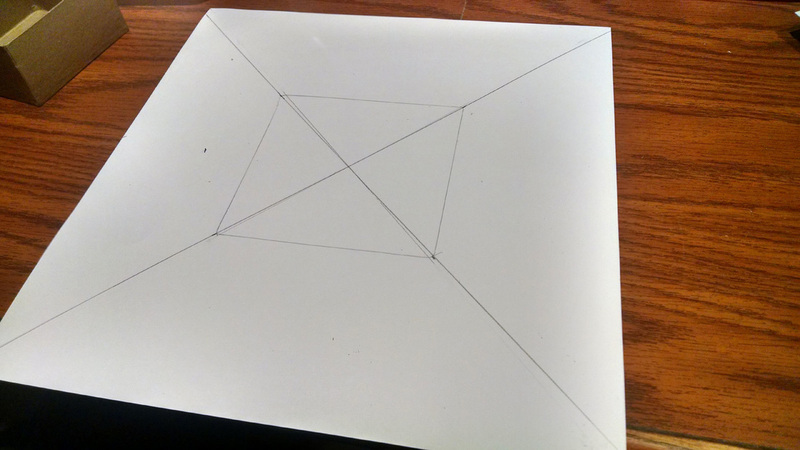 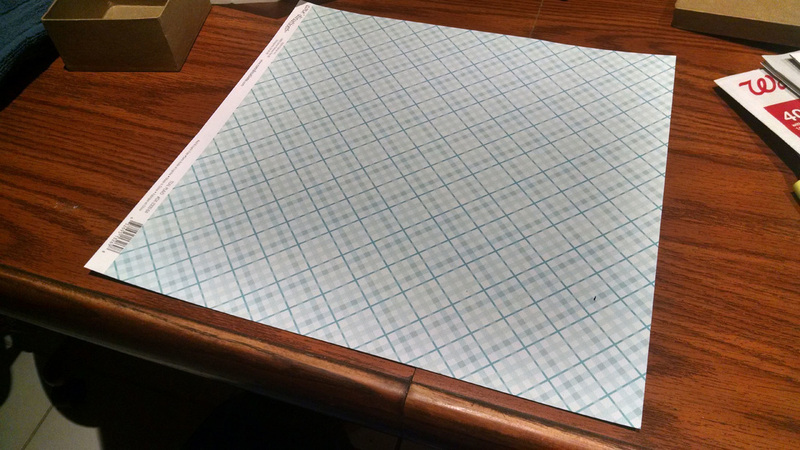 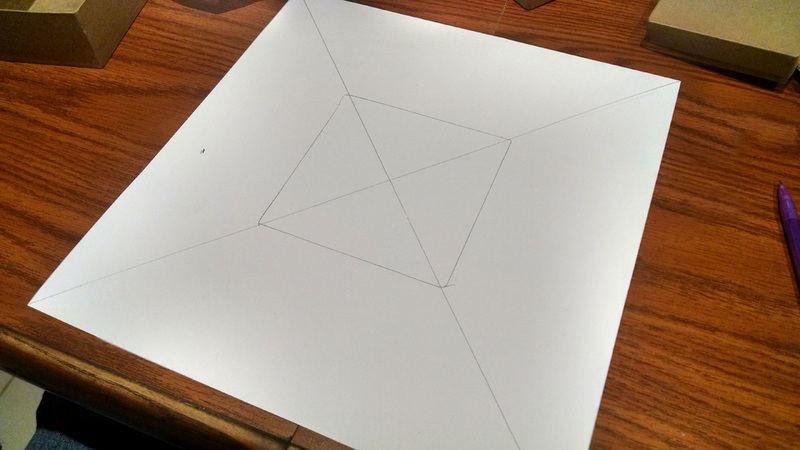 Once aligned, I drew the outline of the bottom of the box on the paper and then cleaned those lines up with a ruler so I had a square footprint of the box in the center of the paper. 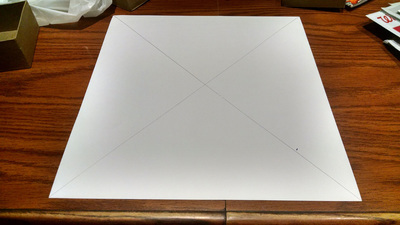 From there I scored the outline of the box bottom on the paper to help with folding, and cut from the corners of the paper to the corners of the box outline in the center. 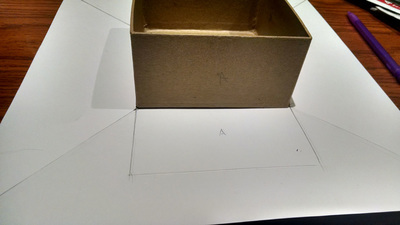 Then I set the box back in the center of the paper and rolled it on each side and marked those outlines (to determine how high the side wall would be). 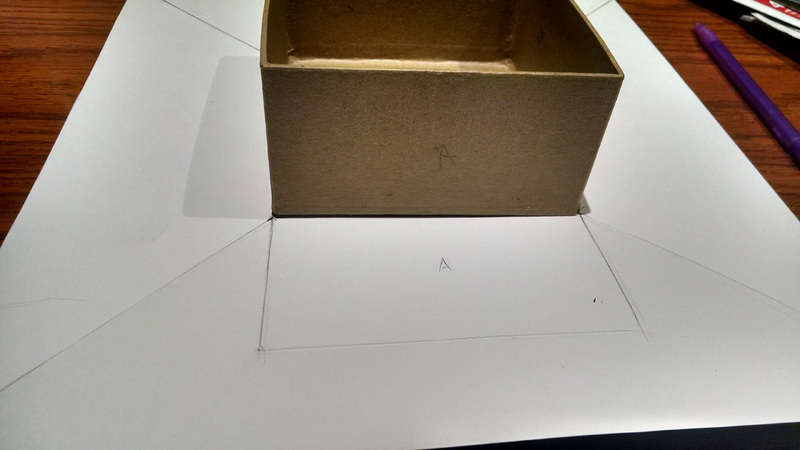 I again cleaned these lines up with a ruler and added just a bit more than 1/16" extra to account for the thickness of the box walls. 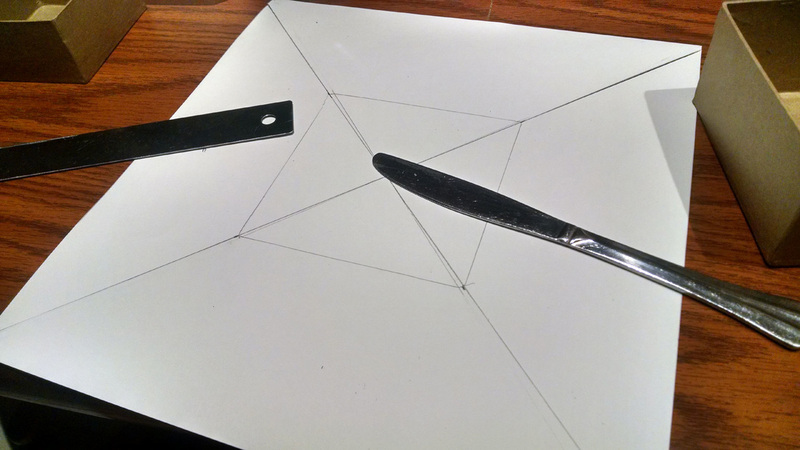 Once the sides were all drawn on the paper, the lines were scored with the dull edge of a butter knife and then I cut them as shown with small flaps that would fold over the edges. 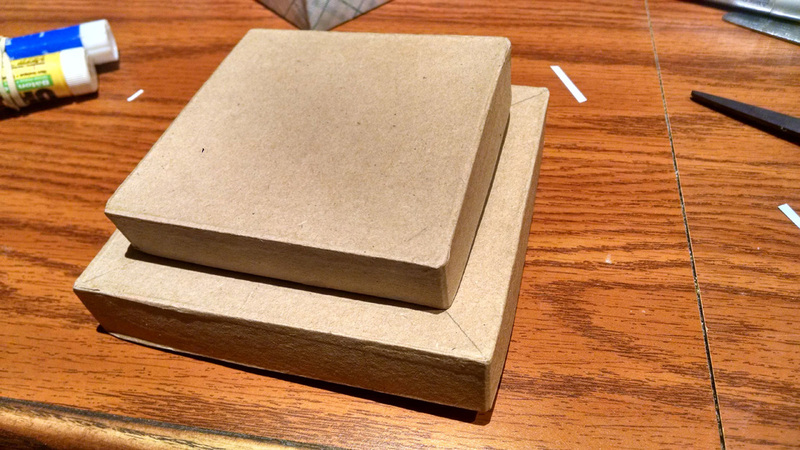 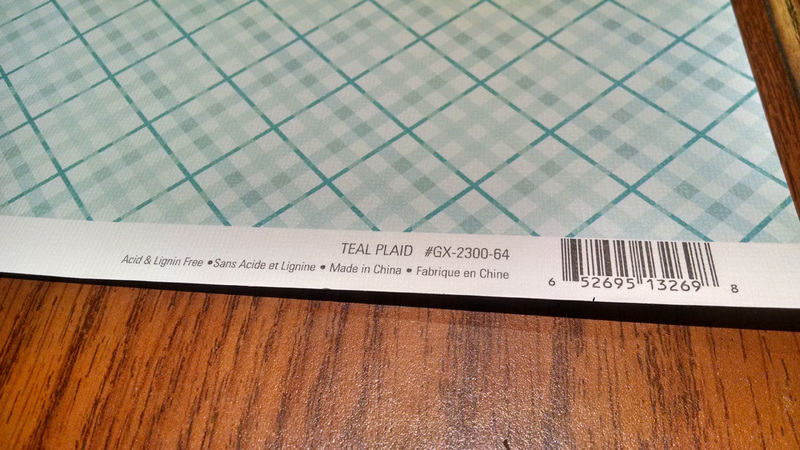 After the cuts were all made, I folded the flaps flat on two opposing sides of the paper, and glued them down. Then the bottom was glued and the sides folded up and glued, with the first sides being the other set of opposing side walls - their flaps were glued to the box to cover the corners. then the other sides with the flaps folded in were glued up, and finally the sides were folded in and glued to finish the bottom of the box. 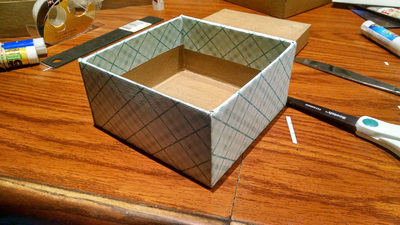 The top of the box will have a window cut in it, so the LED's can shine through. I could have been more creative with this, but a geometric design is simpler to cut out. 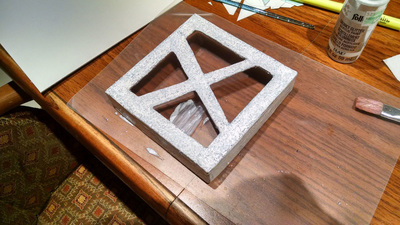 The top was then pained with a base coat of white spray paint, and then I used some special acrylic paint over that. The paint was crap though, so I think it would have been better to use some silver spray paint or just glitter or something like that. 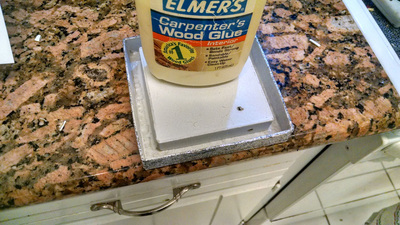 I am going to use the smaller box top in the 2nd picture to contain the electronics in the lid of the box. 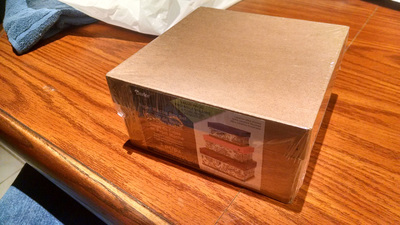 That will become clear later, but it is also the reason I bought a set of nesting boxes. It is important to keep the window cuts inside the perimeter of the smaller box top lid which is why I placed it on the larger lid and outlined it. 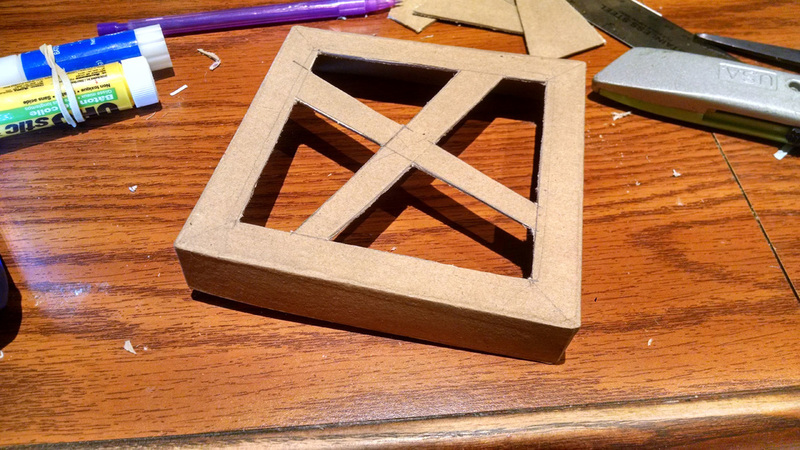 I then added some extra margin and laid out the window design. 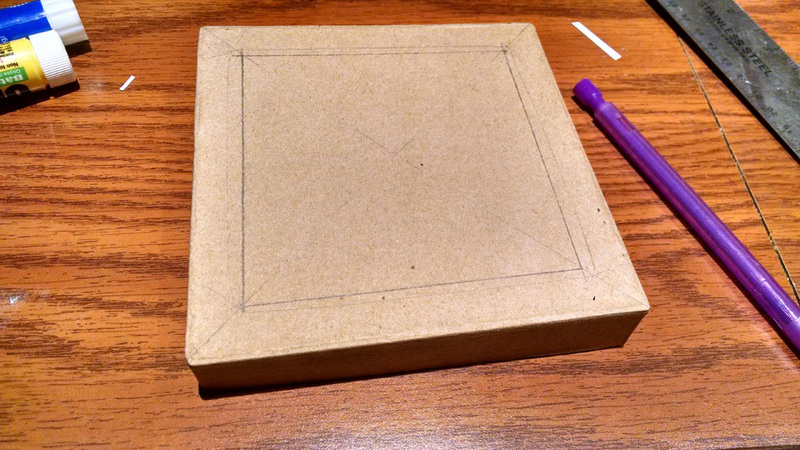 I wanted to keep this simple, but I also wanted to make it tidy since I don't want some kludgey mess of wires inside the box. 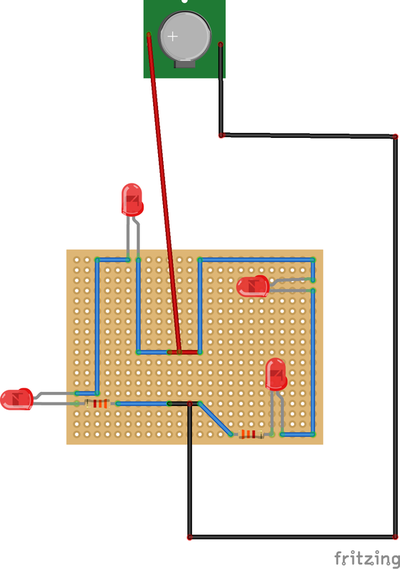 The breadboard is overkill, but was really one of the cheaper options and certainly will make it cleaner. There are many ways to save money on materials for this project, I chose simplicity over cost to a degree. 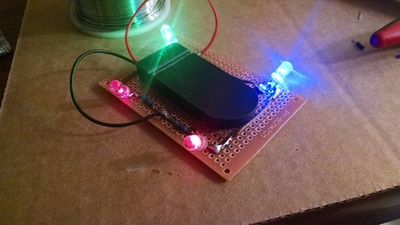 I was thinking of using conductive copper tape and some SMD LED's which may have been even simpler and cleaner looking, but conductive tape is more costly than these cheap breadboards. Anyway, what I decided to do is run 2 series strings of 2 LED's in parallel, off a 6V battery (2 x 3.3V CR3032 cells) with a couple of 3.3kΩ resistors. There is a cool button cell holder on Amazon which is linked above, though there are a number of much cheaper ways to do this. I am using that battery holder since it has a switch which I will set before closing the box, and hopefully the CR3032 cells will run about an hour before running out of juice. The last pic shows the top being glued together, however I missed getting a pic of the translucent paper which I glued to the inside of the top. 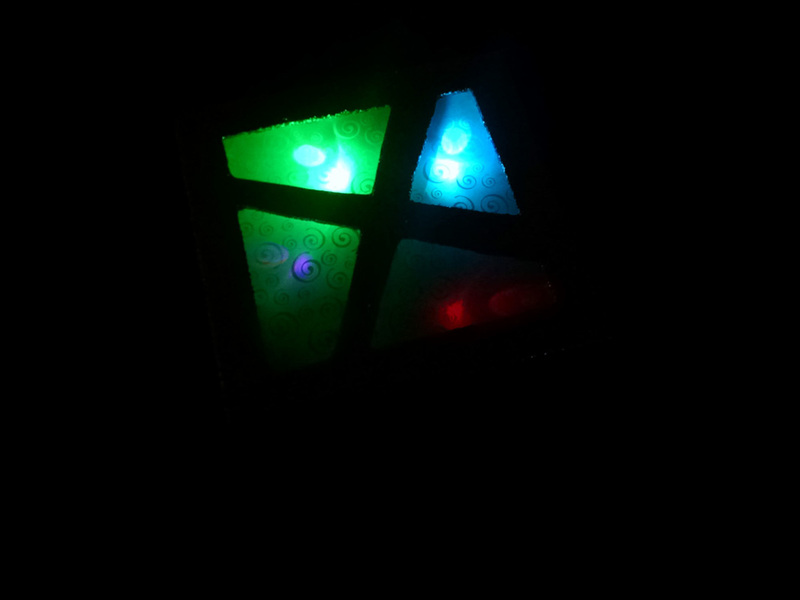 I also covered the board with white paper with the LEDs sticking through which keeps the parts of the board from being seen though the paper. 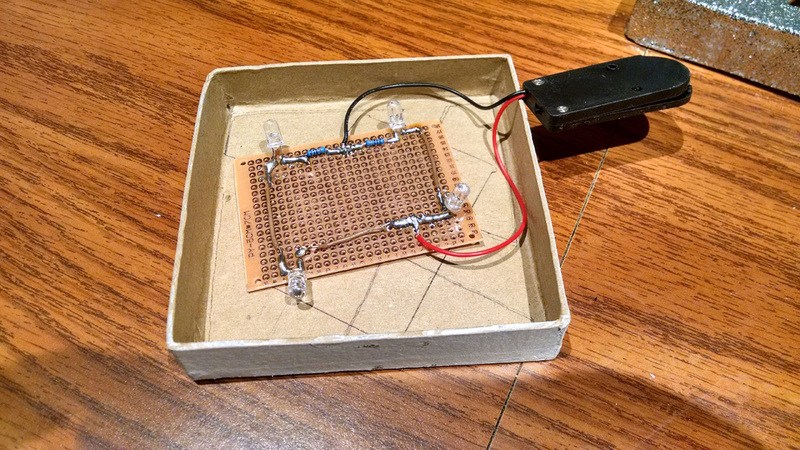 I put a hole in the bottom of the box top where I could flip the switch on the battery holder with a paper clip. This could be improved my moving the battery holder closer to the edge and making a hole or mounting the holder externally - or mounting a switch, or even using a plastic film to block the battery until the box is ready to use - that would be the easiest to hide. Anyway there are tons of ways to make simple switches.